For Genie Bouchard, one of four Canadians to make the second round at the Australian Open after a perfect first round for Canucks, it will be a return to the bright lights of a feature match at a major — a relative rarity since her freefall started more than three years ago. It can be easy to forget that Canada's Eugenie Bouchard may very well have a long and fruitful tennis career ahead of her. A seemingly endless slump sent her tumbling down the rankings but there have been signs of a return to form. With every tournament, Bouchard is looking more like her old self on court and appears ready to make further strides this season. However, her next challenge is as daunting as it gets: a Grand Slam showdown with the legendary Serena Williams on Thursday at Melbourne Park. 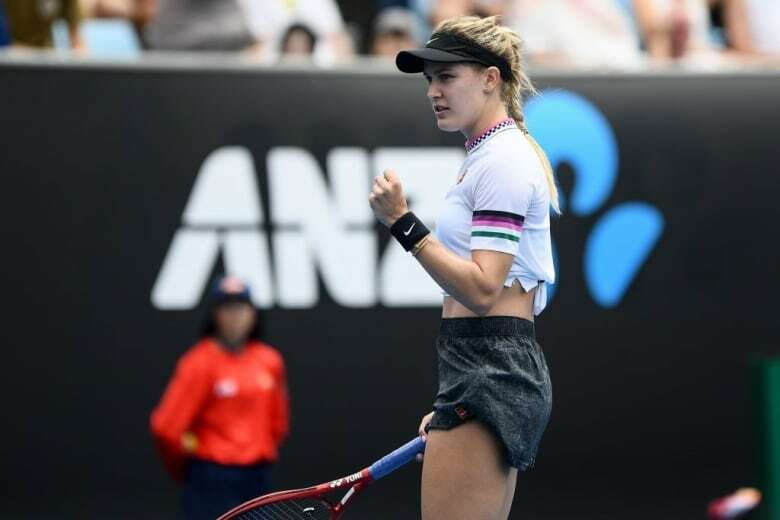 For Bouchard, one of four Canadians to make the second round at the Australian Open after a perfect first round for Canucks, it will be a return to the bright lights of a feature match at a major — a relative rarity since her freefall started more than three years ago. "Bouchard took her share of criticism over the years but she deserves some real credit here," said longtime tennis broadcaster Robert Bettauer. "She was in danger of dropping out of the top 200 in the world over a year ago. She's got her ranking up to No. 79 in the world and it's going to go up from here." The other Canadian in the women's singles draw, 18-year-old Bianca Andreescu of Mississauga, Ont., will play No. 13 Anastasija Sevastova of Latvia in the second round. In men's play, No. 16 seed Milos Raonic of Thornhill, Ont., will take on world No. 59 Stan Wawrinka of Switzerland while No. 25 Denis Shapovalov of Richmond Hill, Ont., will face 78th-ranked Taro Daniel of Japan. Bouchard was barely out of her teens when she cracked the top five in the world rankings in 2014. She made it to two straight Grand Slam semifinals that year before reaching the Wimbledon final. Her slide started the following summer and she closed 2015 at No. 48. Two years later, her ranking slipped to No. 83 and last June, it tumbled to No. 194. Bettauer, a former national team coach, points to two things that helped turn things around for the Westmount, Que., native. He said the decision to return to the Fed Cup team last spring — winning both singles matches in a 3-2 victory over Ukraine — gave Bouchard a big boost. The other was that she started winning matches again at lower-level tournaments. "She needed to do [that] to regain her confidence," he said Tuesday from Victoria. "We're seeing a confident Genie Bouchard. And when Genie Bouchard is confident and she takes the ball on the rise, she really robs her opponents of time. "Her performance yesterday [in the first round] was very impressive. I'm telling you, she's going to give Serena Williams trouble." That's a tall order at any time against the 23-time Grand Slam singles champion. However, it could be argued there may not be a better time for Bouchard to pull off an upset. She impressed at the recent ASB Classic in Auckland, New Zealand — reaching the singles quarterfinals and winning her first career doubles title — and carried it over to Melbourne with a breezy 6-2, 6-1 win over China's Shuai Peng. Bouchard will have little pressure as a stiff underdog against the 16th-seeded Williams. She has also been much more active than the veteran American, who has played just one official match in the last four months. "This is a real opportunity for Bouchard and rest assured, Serena Williams is not taking this match lightly," said Bettauer, a regular tennis analyst on Sportsnet. "She knows that this has the potential of going sideways big time." Williams dispatched Germany's Tatjana Maria 6-0, 6-2 in her opener. She has won both previous meetings against the Canadian. "I'm super excited," Bouchard told reporters in Melbourne. "This is why we play the big tournaments, to play the best players." Williams, who won the 2017 Australian Open title while pregnant, predicted a "great match." "She does everything well and I really like that she doesn't quit," she said. "You know, people write her off, and she doesn't let that bother her. She continues to fight and do what she needs to do." Bouchard seemed destined to become a transcendent star in 2014 after becoming the first Canadian to reach a Grand Slam women's final. The pieces are still in place for that to happen. Only 24, she has a massive following on social media, appeals to several demographics and has that it-factor quality so few possess. Plus, everyone loves a good comeback story. Marvin Ryder, a marketing professor at Hamilton's McMaster University, said a good showing against Williams could really put things in motion on and off the court. "If she were to win or at least acquit herself very well, maybe take it to three sets ... it would help put a little lustre back onto her star," he said. "No doubt about it."